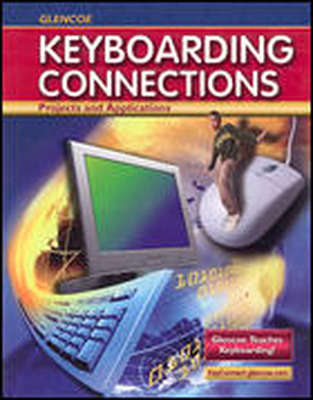 Students will learn keyboarding and complete numerous hands-on projects related to word processing, desktop publishing, presentation software, spreadsheets, and databases. The text was written for middle school students; all activities and projects are age-appropriate. Written for middle school students, Glencoe Keyboarding Connections features a "fun" format complemented by a visually appealing game-like software interface. High-interest skill building exercises, applications, and games consistently hold students' attention. Content includes extensive practice with e-mail, PowerPoint®, and Web page design. An Internet Connection feature provides search tips and relevant links. A user-friendly Web site features include State correlations, language arts activities, and additional teacher resources. Students will learn keyboarding and complete numerous hands-on projects related to word processing, desktop publishing, presentation software, spreadsheets, and databases. All activities and projects are age-appropriate.